Although many individuals turn to extreme diets to quickly shed unwanted pounds the consequences of these restricted food plans can outweigh the benefits of weight loss. 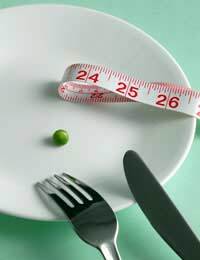 Extreme dieting will usually result in gaining the weight very quickly as it proves extremely difficult to keep the weight off. But, most importantly it can result in dangerous affects on your health. Extreme dieting can create a rise or drop in blood sugar, a deficiency of vitamins, and even stomach pain. A popular type of extreme diet is one where total daily calorie intake is extremely limited or low. In some cases the total number of allowed calories can dip as low as 800. These diets are extremely dangerous for a variety of reasons including their tendency to cause severe stomach pain. One reason that these diets can cause stomach pain is due to hunger. Since the total allotment of calories is so low the amount food allowed is extremely small. When the stomach goes empty for long periods of time it reacts by producing stomach pains as a cue for the need of substance. Hunger pains are not serious by themselves but prolonged periods of hunger can lead to other medical conditions like increased stomach acid production and digestive problems. Another reason that extreme diets can cause stomach pain is due to improper nutrition. Extreme diets limit the amount of food you can eat so you may not be getting enough vitamins and minerals. Malnutrition, the medical term for a lack of vitamins and minerals, can cause stomach cramping, severe abdominal pain, abdominal dissention (swelling), diarrhoea, excess gas, bloating, nausea, and constipation. The best way to avoid these stomach ailments is to eat a variety of foods from every food group and avoid letting your daily calorie intake slip below 1200. Another type of extreme diet that can lead to stomach pain is a food group restrictive diet. When a diet calls for the total elimination of one or more food groups it is almost guaranteed that your system will end up lacking the nutrients it needs for proper digestive function. There are many types of diets that fall into this category but the most commonly known and used diets that feature food group restriction are the Atkins Diet, the Egg and Spinach Diet, the Cabbage Soup Diet, and the Raw Foods Diet. These diets require that the user get all of their daily calories from only two or three food groups. For example, the Atkins Diet restricts the intake of fruits and vegetables and leans heavily on the consumption of meat. A lack of fruits and vegetables can lead to malnutrition and an overabundance of meat consumption can lead to slowed digestion and constipation. In the case of the Cabbage Soup Diet the allowed foods are known for causing excess gas and bloating which can lead to abdominal pain, and the lack of fruits and vitamin C rich vegetables can again lead to malnutrition. Many extreme diets that are used on a regular basis, use pills to intentionally interrupt the digestive process to keep fat from being absorbed by the body. Often called “fat blockers” or a variety of other names, these pills basically work as a laxative for the body. Typically, the pills must be taken at a certain time before every meal, and they will speed up the digestive process by sending any fatty parts of the food right back out the body. These types of pills may work to help individuals lose weight, but they also cause harm within the body. Dieters who rely on these pills are likely to experience stomach pain because the stomach and digestive tract is forced to work extra hard to rid the body of foods it would normally be absorbing. As a result of a faster digestive process many individuals experience diarrhoea, which naturally causes stomach cramping and pain. The best way to lose weight and avoid stomach pain is to steer clear of extreme diets and opt instead to follow a lower calorie, healthy eating plan. Start by making sure that you take in at least 1200 calories each day. By limiting caloric intake (but reaching the minimum of 1200 calories per day), and obtaining these calories through a variety of healthy foods, you will lose weight. If you include a variety of foods from each food group (grains, meats, fruits, vegetables, dairy, fats), limit the intake of high sugar, empty calorie foods, and maintain fibre intake, you can lose weight without the fad diet. Sure it will take a little longer to lose the weight, but you will be losing weight without stomach pain. Plus, an added bonus is that you will be more likely to keep the weight off!